The holiday season is fast approaching. For many of us, this week is the start of it all. As we begin to prepare a festive meal, sharing moments with friend and family, many of us will want our pets to be a part of the love. After all, our pets are part of our family, right? Before you fill an extra plate with some Thanksgiving trimmings, pause for a moment. Is the food we indulge in at the holidays really best to share with our pets? The simple answer is, no it is not. The list of dangerous ingredients is lengthy. Onions, mushrooms, gravy, garlic, bones, chocolate and yes, there is more. The result of feeding our food to pets can lead to an emergency veterinary appointment for pancreatitis, a foreign body, vomiting and much more. Reminding any visitors to your home about the dangers of table food and to keep an eye on pets can be a helpful tip and may also avoid any inappropriate treats, the more attention your pet gets this time of year the better! It’s not just food that can pose a problem for our pets around the holidays. Many cats like to play with ribbons, but if ingested can cause an obstruction. House plants, such as poinsettias, that make our home festive can also be dangerous. So instead of looking at all the things we should avoid doing with our pets, how can we include them in this special time of year? The beauty of our four legged family members, is that it is really quite simple to make a day extra special. Take an extra long walk or play fetch a few more times than usual. Give some extra belly rubs or scratches behind an ear. If you want to give a special treat, make sure it is formulated and safe for your pet before giving. Better yet, after you give your pet some extra attention check with your local shelter to see what their holiday wish list may include to give back to those pets that many not have a home for holidays. 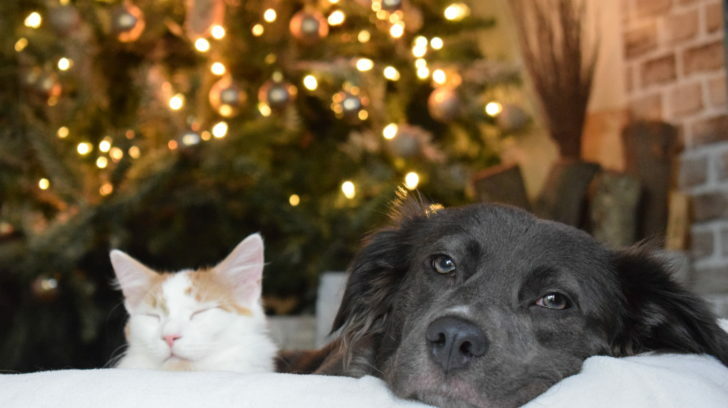 So whether you are busy trimming a tree, stuffing a turkey, lighting a menorah or another holiday celebration, a little forethought can help avoid an unwanted veterinary appointment and keep your holiday celebration going all season long. Enjoy this holiday season and the wet noses that help make it so special.